Next week, my mum and littlest sis are visiting me from the States… I AM SO EXCITED!!!!! This is the first time out of the country for both of them. They visit me every summer, and we always find the best stuff to do. We've been parasailing and indoor skydiving. We've walked the Grand Canyon, and played at Legoland. We watch movies, and snuggle, and order take-out, and generally have an awesome time. And now I get to show them Europe. How cool is that? We have a long list of destinations this summer, including stops in Germany, Italy, and France. I'll keep you up as best I can while we're traveling, of course. In the meantime, I want to share some idea with you for when you have guests visit at your overseas duty station. I think a welcome basket is such a great idea, and I was determined to make one for my family. But what to include? 1. Toiletries - Especially for an extended visit, these items take up unnecessary room and add weight in suitcases. 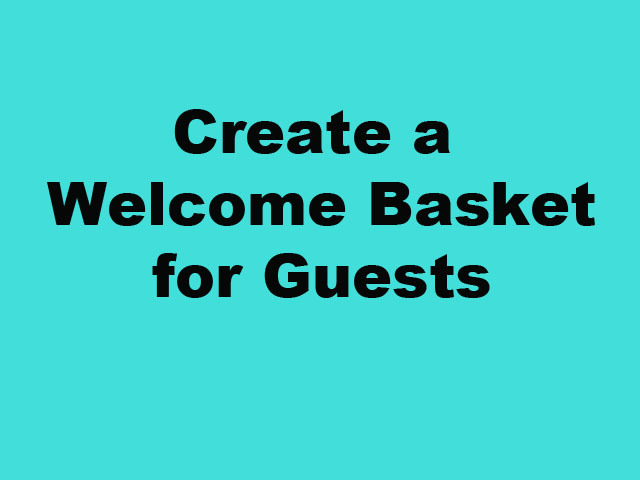 Ask your guest what products they use, then provide them on their arrival. Common items are: shampoo, conditioner, deodorant, hairspray and other hair products, hairbrushes, baby powder, sunscreen, toothpaste and toothbrushes, dental floss, razors, face wash, loofahs, lotions, body wash. If you're especially ambitious, you can provide them with their own, handmade Brown Sugar Scrub. I love that stuff! 2. Small Appliances - This sounds weird, but think about it. You are living overseas. The electric is definitely not the same. No adapter in the world is going to help an American blow dryer in a European outlet. Keeping a few of these extra items around for guests is a great idea, don't you think? Have a spare hair dryer, straightener, curling iron, etc. 3. Adapters - while smaller appliances are unable to convert the electricity, some devices can. For example, most smartphones, tablets, and laptops are capable of converting the energy. Keep extra adapter plugs handy in your guest room so they can charge their electronic devices. 4. First Aid and Medication - Hopefully you won't need these things, but stock your guests' bathroom with basic first aid supplies, like bandaids. Also include a small bottle of pain reliever, allergy medication, tissues, etc. It's better to be prepared than searching for these items while you're on vacation. 5. Bottled Water - I know not everyone likes to buy bottles, but it's very convenient for your guests to have some in their room. I purchased both the flat and the fizzy kind, so my Fam could get a taste of what is commonly served here in Europe before being surprised by it at a meal. 6. Snacks - Some small snacks are a great idea. Jet leg will likely hit your visitors, and they may wake up at 3am a little hungry. With snacks in their basket, they won't need to wander around an unfamiliar house in the middle of the night to search out food. 7. Local candy or treats - Being that we're in Germany, I filled my family's basket with lots of Kinder chocolate! I mean, it is the best. I also included a small bag of wafer cookies and a bag of Haribo gummies (another German specialty). 8. Entertainment - in the age of electronic devices, people seem to have less need of books and magazines. But these are still a great idea to include in the basket. I suggest purchasing some travel magazines, or putting a Rick Steves travel guide in the basket. This is something they likely wouldn't have purchased for themselves, but also something they would love to look at. 9. Comfort Items - There are some items I use at home everyday, but wouldn't pack to take with me on a long trip because of suitcase space. Consider having an extra bathrobe for guests, or house slippers. Fuzzy house socks. Maybe even an eye mask. These are small comforts that can make a big difference. 11. 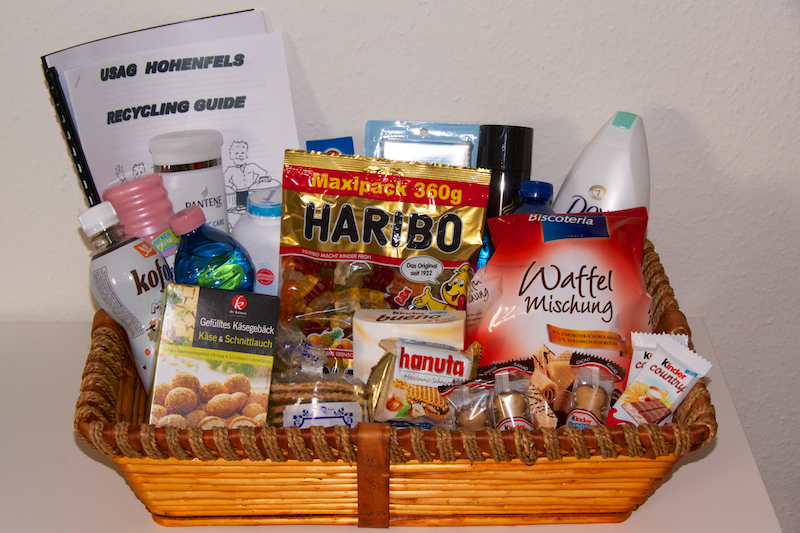 Local Information - I included a recycling guide in my basket, along with a local map and a small phrasebook. Add a list with emergency phone numbers (911 is not the same here), your wifi password, and any other pertinent information. We still had our welcome packet from when we arrived, so I added that as well. 12. Gift - a small gift is a nice way to commemorate a trip, and a fun way to say 'welcome'. Think about magnets, Christmas ornaments, or bottles of wine. Be creative! 13. Re-Useable Bag - This are oh so handy to have around! I like to purchase the small bags that fold up right into your purse. 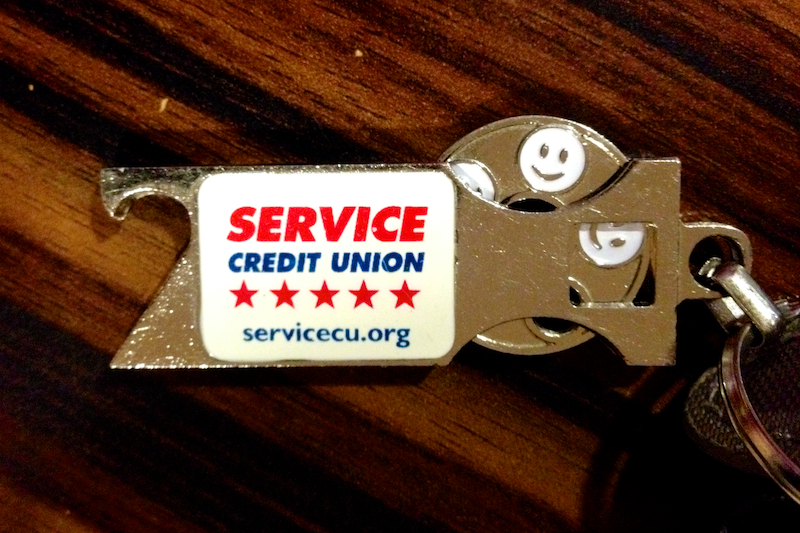 These are great for your guests as they purchase souvenirs on their trip. So many places don't offer a bag at all, and others only have them available for purchase. Take the guess work out of it, and let your guests keep one handy! I found some for less than a euro at Ikea, totally perfect. So, what would you put in a welcome basket for your guests? Feel free to comment below, and I'll add your ideas to the post. Until next time, my friends!